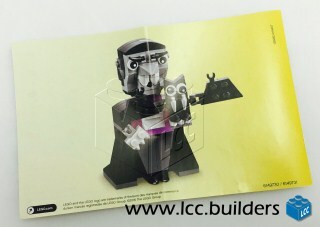 This year's Easter set, 40202, is being found in the wild now so as is often the case with seasonal sets it offers us a glimpse of the next one to be released on the back of the instructions, which this year will be a vampire and bat for Halloween (40203). You can view a larger version of the image at lcc.builders. Thanks to Sophie for the news. It's a bit clumsy, but they've packed in a lot of personality. I think I like it! Whoa, that is unexpected! Looks really fun. Nice surprise then. He looks really cute! Aw, it's adorable... but I won't get it. Looks like the fangs are coming out of his nose. It's neat but not my cup of tea. Much more creative than the dog and chick. Well, I have zero interest in these sets compared to last year's vignettes, so that's a little bit of money saved anyway, can put it towards all those d2c sets instead, haha. I also far, far prefer the vignettes or the seasonal polys they did a couple years ago. These figures are awkward and ugly. I never buy them. I think this is superb, and very cleverly done! I like it. And for all those "vignettes were better" - enough is enough. Vignettes year after year - it would be too much. And this vampire is very nice, even nicer than last year halloween vignette. I didn't like the Valentine's Dog or the Easterchicken, but this ist cool. I'll buy several for friends and family! Thumbs up! Wow Easter to Halloween is quite a bit of time to wait. I wish they would include more holidays or have a summer themed one. Uh....the fangs are coming out of his nose. I like things being changed up, but I can not get past such a basic design flaw. We will skip this one.